Search Engine and Referral Traffic - Which converts better ? →Search Engine and Referral Traffic – Which converts better ? It’s a mistake if you are not building a list. Check this post for some more information you may need. There are so many search engines out there that bring us traffic. Of course Google, Yahoo and Bing and the big game players. If you want these robots to send traffic your way, you must play according to their roles. People have tried several ways to bypass these roles using blackhat methods but the end results is always failure. If you are trying any rough games to get traffic from search engines, you are building foundation for disaster. don’t do it! Google is fighting garbage and struggling to remove meaningless links from their database. Every update is aimed at one thing – filtering off rubbish and giving the best to the researchers. Any attempt at helping Google will be rewarded. Help Google find these ‘best’ contents and Google will reward you by placing your content on the top of SERP. The only way to do this is by providing this so much searched content on your blog. – > Any SEO plugin? One of the plugins you’ll need at this moment is Yoast SEO plugin. That’s the most recommended free SEO plugin you’ll need for your WordPress blog. Don’t worry about how to use this plugin. Check out this tutorials by the authors of the plugin. It has the meet and drinks you need. NB: Don’t write articles for Search engines. Write for your human readers and search engines will find and love your articles. This is traffic from the various submissions on the Internet for your website. That means the more you submit your blog to diverse locations, the more referral traffic you get. I recently came across Managewp and as a matter of fact, this peice has cought my attention in recent times. This is more dedicated to WordPress contents though. I have gotten most of my posts kicked out because they are not WordPress focused. This post you are reading for instance will not be accepted on the platform. If you however have a WordPress related post (Tutorial and how tos) this will be a nice place to submit and gain some more exposure. More referral traffic can be gotten through blog commenting, guest posting, directory submission and forum posting (though with a lot of caution), buying of ad space on other sites, etc. Where do you get the most referral traffic from? Now if you have some money you want to spend around, you may go ahead and do some PPC campaigns for your blog on Google (search PPC) or Facebook (Social PPC). There so many PPC platforms out there though. There is been this debate out there on which traffic source is the best. Yes! I use the word ‘best’ because I’m putting everything together. Now, my real point is, which one is most targeted? I think Search engines bring the most targeted traffic. That kind of makes it safe to conclude that Search Engine traffic converts better. Search engine traffic is keyword driven. If the keyword is the best summary of what the visitor wants, there are higher chances of conversion. The visitor is on your blog because he/she searches for something and the search engine things you have the best answer. After reading through your post and finding out “this is what I was looking for”, the the call to action button suffers a click. This is part 17 in the series to create a blog that makes money. Be sure to check out the front page where if you missed some points. Wonderful topic my friend, wonderful topic. I love getting search engine traffic to my blog because I know that is traffic that is targeted to my blog. 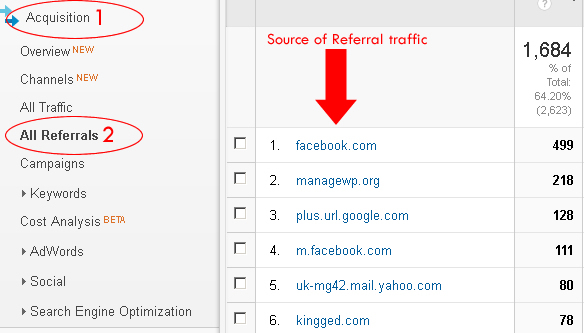 Referral traffic is good for me as well because I know that my link is visible on other websites. Great tips listed as well and I think search engine traffic converts more. That’s perfect bro and thanks for sharing your point in the comment. Very good article! Many people forget that the goal of a blog is to capture an email. Because this is the only way to be sure you can bring people back on your blog. Search Engine traffic is great because it’s high quality but if you don’t get them to opt-in, they may never find you again in their next search. Never depend on someone else for your traffic. I personally prefer search engine traffic. But some times I tire of battling it out with the likes of G. Even when you follow the rules and try to do it right, you get bounced around. If I had a choice, I would rather have repeat customers, it just not always steady and you can’t rely on it totally. Referral traffic is good but search engine traffic is always better i always want my traffic from search engine. Awesome article, want to know more about Google rank factors. I think we might go with organic traffic, which is the one that converts more. Thanks for the great post. It’s certainly an interesting thought as to which type of traffic converts better. For me, I think it’s hard to say for sure without some testing and comparison of the results as to which is the better source of conversions. I think that they both have their merits. I think you make a good point about how people who find your blog via a search engine already know what it is that they are searching for and so are perhaps more likely to take the desired action on your blog when they get there. However, unless they already know you, they’re going to need convincing right from the moment they get to your page. On the other hand, people who arrive via referrals are usually there because they’ve already seen something about you or your blog that has piqued their curiosity or given them some sort of compulsion to visit, whether that be an article, a recommendation from someone, a video, or whatever. So in those cases, some of the groundwork has already been done and those visitors may be ‘preconditioned’ to a degree before they get there. Personally, I don’t concern myself too much with search engines. Of course, we should always bear them in mind but I think it’s always going to be a game of ‘catch up’ with them and too much time can be wasted on trying to perfect SEO that could be spent on the quality of what it is that we’re offering. As you say, you should write for your human readers and not write for search engines. This is something that I feel very strongly about and believe that if you use this approach then the SEO side of things will, to some degree, take care of itself, especially in this modern, web 2.0 era that is heavily social and content based. I’ve been trying to have some good search engine traffic but most of my traffic still comes from social media. I don’t know if my articles are not well optimized or it’s that it’s going to take some time for me to start getting search engine traffic since my blog is fairly new. Ensttine, a very good point about “targeted” traffic because that is the goal of search engines, to find the best content related to that keyword. It is much easier to write without putting the focus on search engines. As Matt Cutts tells us if visitors find your content interesting the engines will find you. Very nice topic my friends. Thanks for understanding me that which traffic is good for us. As my statics says I have over 45+ traffic from search engine and rest others from social and referral. But I still go with organic traffic. Thanks Enstine for sharing nice stuff. I have to say man, this post couldn’t have come at a better time for me. I have been wondering for a couple days now whether referral traffic or organic traffic is more effective for websites. And I think you’re dead on right — while referrals aren’t bad, organic is almost 100% your target market, and thus would have a higher chance of converting. Thanks for sharing man, and have a great weekend. From my experience in earlier days, it’s quite easy to rank in Google quickly and easily. But after this animal updates it become more difficult to rank in Google for Organic traffic. One of my best suggestion to build some micro niche site (Clickbank products or amazon) and start driving traffic through Facebook.. Both of them offers your site a big thing, I mean both of them have something for us to offer and we know how important these two are. I guess, I have to be biased. Because referral could be great if you are offering one site to the right people. While on Search engine, the keywords that you will use should be good and searchable. People frequently dig in or hit the search bar/box for help. And yes of course, Kingged.com is one great site when talking about referrals. Indeed growing so rapidly and can be a very huge source of traffic to your site. Don’t write articles for Search engines. Write for your human readers and search engines will find and love your articles. Search engine traffic and referral traffic are fundamental for online success. Free referral content syndication website like kingged.com are truly growing rapidly and could very well help online marketers to gain huge targetted traffic. A strategy of combining search engine and referral traffic for effective result. This post some shown the need of that strategy. This comment was shared in kingged.com where this post was found. Both, I guess. You can get the best of both worlds by making sure your content’s superb(search engine bots as you’ve shared love that), and make sure to take advantage and make the most out of social sharing sites like Kingged.com. Interesting to see the list of sources for referral links. That’s a lot of source, and even if you only use 2 or 3 out of all these, I think you’re giving yourself a favor. Definitely search engine traffic converts better. Because we get target able customer by focusing on keyword and ranking it on the top of search engines. Referral traffic convert well when they are very target able but i think search engine traffic convert well than referral traffic. Obviously we need to target our audience and provide high quality content to get good results. Anyway, thanks a lot for sharing this informative post with us. Excellent post indeed, the main preference of every blogger is to get traffic from Search engines. But other sources of traffic are also useful in this scenario. I think Search engine traffic is so important. I get totally my traffic from search engine. Actually My niche related to entertainment like Anniversary wishes, Birthday wishes, No blogger take interest in this niche. So that I mostly spend my time to make natural backlinks. Referral traffic is also good way but search engine is most. Any way Good content. Thanks for sharing with us. Your conclusion says it all – Keywords reveals you visitors intent and what they are looking for. Hence, search traffic is the best. Social traffic is for blogs that want to be known or big brands that want to be in the face of their customers. But for bloggers looking for instant conversion, search traffic is the best and that’s what I explore more.